String.parseXML() now also parses the <? .. ?> XML header. The <element></element> empty subtree warning is now only printed if debugLevel is >90. + some changes regarding the macosx port..
it's already 23:56:14 and still the 13-Sep-2005. today is Tuesday, the 13. of Sep in the year 2005.
xmas is on a Sunday, the 358. day of this year. the 1-Jan-1970 was a Thursday. Open this link http://127.0.0.1:8080//rio%20namespaces (query available namespaces). return as 4 "PersonDAO" "RoleDAO" "rio" "TestDAO"
return (PersonVO 7 forename s "Foo" role_id l 1 surname s "Bar" birthdate t 2005-08-25-17-52-04-781250000 id l 1 role (RoleVO 3 granted_procedures as 0 id l 1 name s "User" name s "Foo Bar"
fixed the 256-classes limitation. I did a lil' experiment and wrote a script that generates 682 source files which are derived from this template (which contains 6 classes, 9 members and 12 methods) resulting in a total of 75020 LOC, 4092 classes, 36828 members, 49104 methods. It took ~17s to compile/start/run the script with a peak memory usage of ~300MByte :) I set the class limit to a more reasonable value (1024 classes) (i.e. 18700 LOC, 1020 classes, 9180 members and 12240 methods in 170 files). The script then took ~2s to finish with a peak memory usage of ~23Mbytes. fix: replaced "Object Object<...>" codepath in print statement by "<null>"
added layout weights and alignments. Example: testui-21Aug2005-align.tkx (screenshot) Source: testalign.xfm. fix: String.parseXML(): <-- comments are now parsed correctly; entity names may now also start with capital letters. removed C++ support classes. 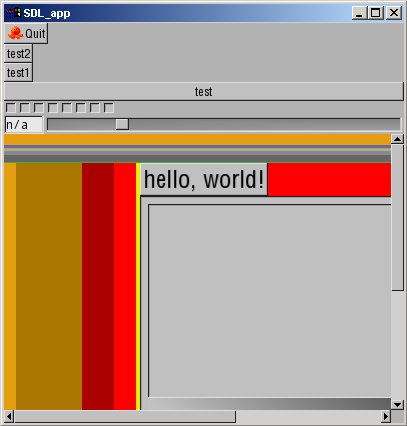 The UI toolkit is now (almost) entirely written in tkScript. The "tkui" plugin just exports 2 functions to show file dialogs..
fun fact: it takes 0,0758s on my Athlon XP 2500+ to compile the 9825 lines of script code for the UI framework, parse the test1.xfm file, create the layer hierarchy, create the event handler script, compile it and then exit :D (i.e. do everything but open a window). 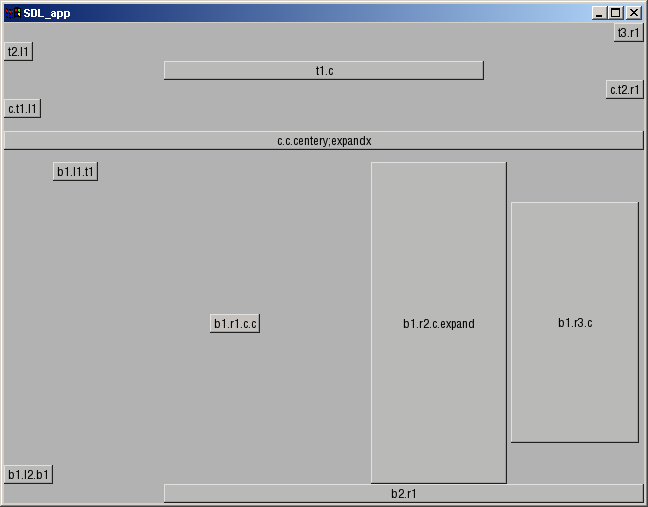 The process uses ~4,4Mbytes RAM if a window has been opened. 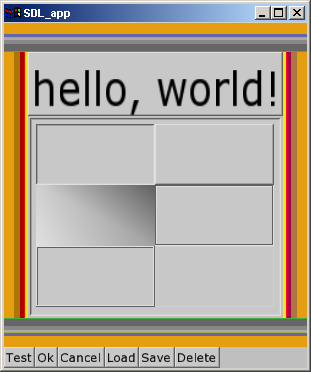 fix: since SDL seems to report the wrong surface geometry for very small windows Viewport.width and Viewport.height now returns the initial OpenGL viewport size. fix: Texture.expand2n() now returns quadratic texture sizes. The old behaviour may have caused problems with "old" GL drivers. This will become a configuration property (as soon as configuration properties are implemented :-) ). added expr. and notnull constraints which can be applied to class method/function arguments.. See constraints.tks.html example. [---]    1.: "MUI":897: MyForm::consumeAction() (in "Main":93). [---]    2.: "MButton":103: Layer::provideAction() (in "MUI":819). [---]    3.: "MUI":1181: Button::onMouse() (in "MButton":90). [---]    4.: "MUI":1237: UI::HandleMouseEvent() (in "MUI":1078). [---]    5.: "MUI":142: UI::OnMouse() (in "MUI":1097). [---]    6.: "MUI":1076: <native> SDL::eventLoop(). [---]    7.: "Main":220: UI::Run() (in "MUI":1038). added psystem(String _cmd, int _accessType, String _buf) API call. The call uses popen/fread/fwrite/pclose to write to stdin resp. read from stdout of a shell-command. See the psystem_dir.tks example which launches the "ls" command and grabs its output. improved linux debugging support (contributed by Carsten Busse). The new SEGV, FPE, ILL signal handlers print out lots of debug information and ultimately launch the GNU debugger (if it's installed). added Clipboard_scrap.cpp which is based on Sam Lantingas "scrap.c" code. The "scrap" clipboard code is used for X11 and QNX targets. 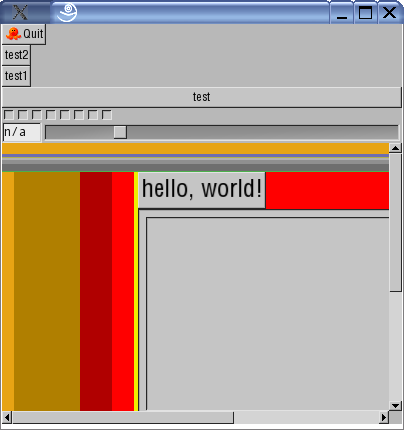 added Slider, CheckBox and TextField class implementations. See testui-26Jun2005.tkx (screenshot). 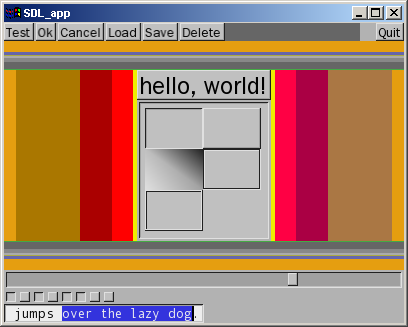 note: Linux users currently also need to use the xcutsel tool since the current Clipboard_x11.cpp implementation uses cut buffers, not selections (this will change ASAP). object-object, object-int and object-float double arg expressions now support variable return types (e.g. vecf*vecf=float). This change is currently only important for plugins which provide new number objects. added: fail-safe get(int _index) method for each array class. This will simply return void/null/0/0.0f if the index does not exist. fix: bug in the internal class template generator, baseclasses of baseclasses were added multiple times resulting in "off and mdsize differ" errors. fix: c'n'paste bug in classmember hashtable assign statement. fix: (22:54 CET) linux "libdl" plugin loader now uses RTLD_GLOBAL instead of RTLD_NOW which fixes some obscure crashes :) thx to walker for helping me out with this issue. Also see here. print #(s); // should print "<null>"
re-added: some sanity checks in classmethodecall (scriptclassobject.classMethod()) ("class type mismatch"). this will turn some "access violations" into somewhat more meaningful error messages. fixed stupid(!) c'n'p mistake so the HashTable array operator works again on regular (non-class-member) variables. float constants may now contain the 'f' char (like in "C"), e.g. "float f=1.2f;"
// Note: while(i) tests whether the object value is not null, this is not what we want here. //       ints to LongLong number objects. fixed: loop(Object) (now converts object to integer). note that the while and if statements will simply check whether the Object is null. See above. added: Buffer::yacArrayGetNumElements() now returns io_offset, yacArrayGetMaxElements returns size. bugfix: static class members of all classes are now deleted before the first class is deleted..
added: YAC_OP_ADD, YAC_OP_SUB, YAC_OP_MUL, YAC_OP_DIV, YAC_OP_MOD, YAC_OP_SHL, YAC_OP_SHR, YAC_OP_CEQ, YAC_OP_CNE, YAC_OP_CLE, YAC_OP_CLT, YAC_OP_CGE, YAC_OP_CGT, YAC_OP_AND, YAC_OP_OR, YAC_OP_EOR, YAC_OP_NOT, YAC_OP_BITNOT, YAC_OP_LAND, YAC_OP_LOR, YAC_OP_LEOR, YAC_OP_NEG constants. added -nur, -nuf, -num command line options to forbid cross referencing of fields and/or functions/methods. added tgclso_fasta.tks example (from the great computer language shootout). Also see here. added tgclso_fannkuch.tks example (from the great computer language shootout). Note: This is not meant to be a real-world usecase test but rather an implementation of a very specific algorithm. Also see here. added tgclso_heapsort.tks example (from the great computer language shootout). forgot to initialize static class members which do not have an init expression..
added support for static class members, see class_static.tks example. added class_construct.tks example which demonstrates how to work-around the missing method/constructor overloading ability. added support for class member <= initializers, see class_init.tks. - please note that in this example, <= grabs the _occurence_ of the constant hashtable object; it is not altered until the next class instance is created (i.e. the # expression is called again). Please consider this if your initializers contain non-constant expressions! added support for class member initializers, see class_init.tks. added class functions ("static methods"). See example. added class constants. See example. ported another benchmark from the (new) great computer language shootout; see nbody.tks.